"3D printing made us save 40% time on product development"
Svarmi is an Icelandic company that provides drones as a service (DaaS) in remote sensing or earth observation. We develop our own drones both fixed wing and multicopters, and we are capable of integrating any sensor required by our customer. Svarmi provides highly customizable services with innovative technology and data processing. 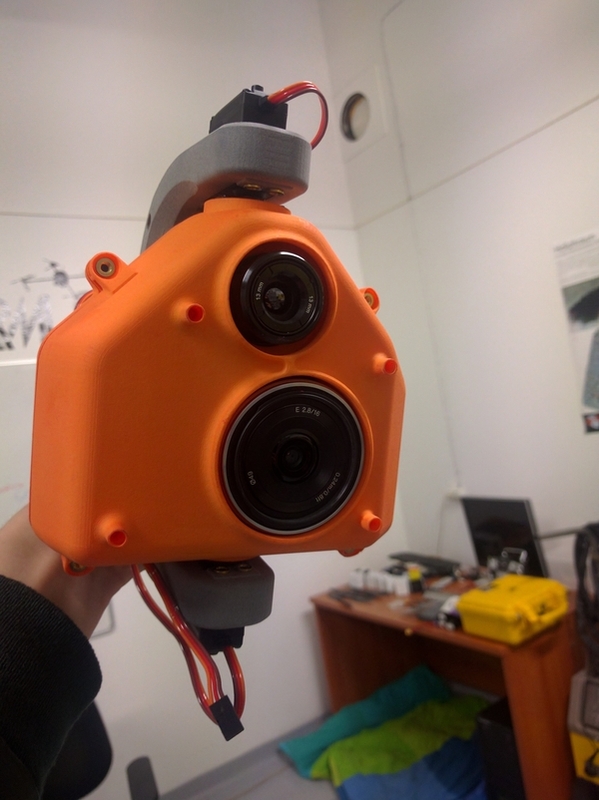 Currently, Svarmi is developing a new potentially disruptive solution for the industry of earth observation with a fully autonomous 3D printed drone solution. We are a group of people with a very broad field of interest and knowledge. In Svarmi we have combined this knowledge to create innovative technologies and services that we provide to our customers. Our team comes from Iceland, Spain, and Germany but we are all located in Iceland. Our expertise is in mechanical and electrical engineering, programming, machine learning, computer vision, GIS, remote sensing, and geology. Together we are leading experts in the design and use of drones for earth observation as well as in processing the data from the drones in new innovative ways. Our customers are engineering firms, architecture firms, companies in the energy sector, landfill owners, universities, researchers and many others. Our customers can be anyone who requires on-demand data from the above, data like ortho-mosaic aerial images, digital elevation models, 3D models, thermal maps, machinery, building inspections and basically, any case where a sensor is required in the air. Can you give us examples of projects you’ve achieved or you’re working on? There are two projects we would like to share with you. An aluminum smelter in Iceland approached Svarmi and asked if it was possible to map the exhaust pipes from the aluminum smelter pots. A thermal and a normal RGB camera was required for the job. Because of the high current going into the aluminum smelters, many modern electronic systems cannot function because of the strong magnetic interference caused by the electricity. This caused a problem when flying drones so close to the conductor of electricity. But the exhaust pipes were only a few meters away from the conductors. 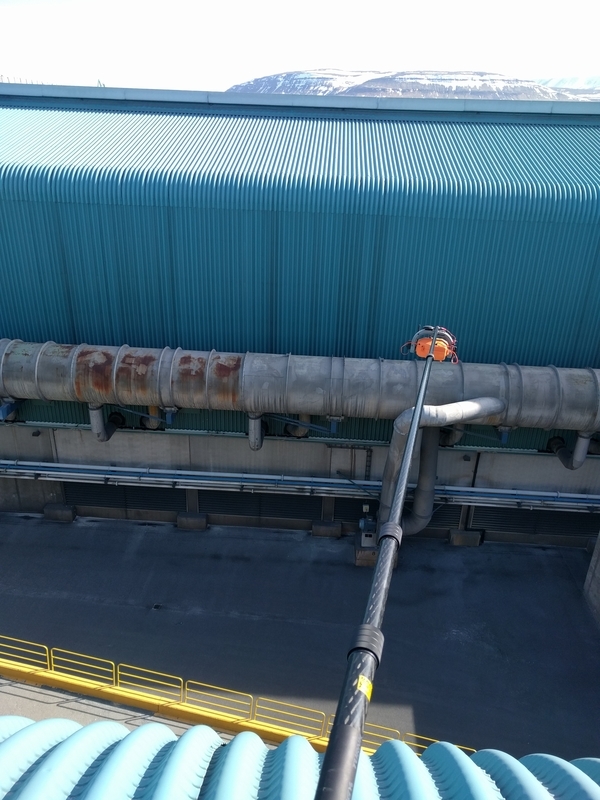 Another problem was that the exhaust pipe went under other structures along the length of the pipe making the use of GPS controlled drone dangerous in such a constrained environment. Those constraints called for a new solution and that solution was a rig that would be carried along the length of the pipe. This rig had all the same internals as a drone except no motors to move it since it was carried manually. Since the rig was to be carried at the end of a long pole it was very important to keep the rig as lightweight as possible. 3D printing the rig was a straightforward solution for Svarmi after a good experience of 3D printing in other projects. The result was a lightweight rig that would always stay horizontal with respect to the ground regardless of the angle of the pole. The design took about 2 days and we sent the part to Sculpteo for a 3D print. 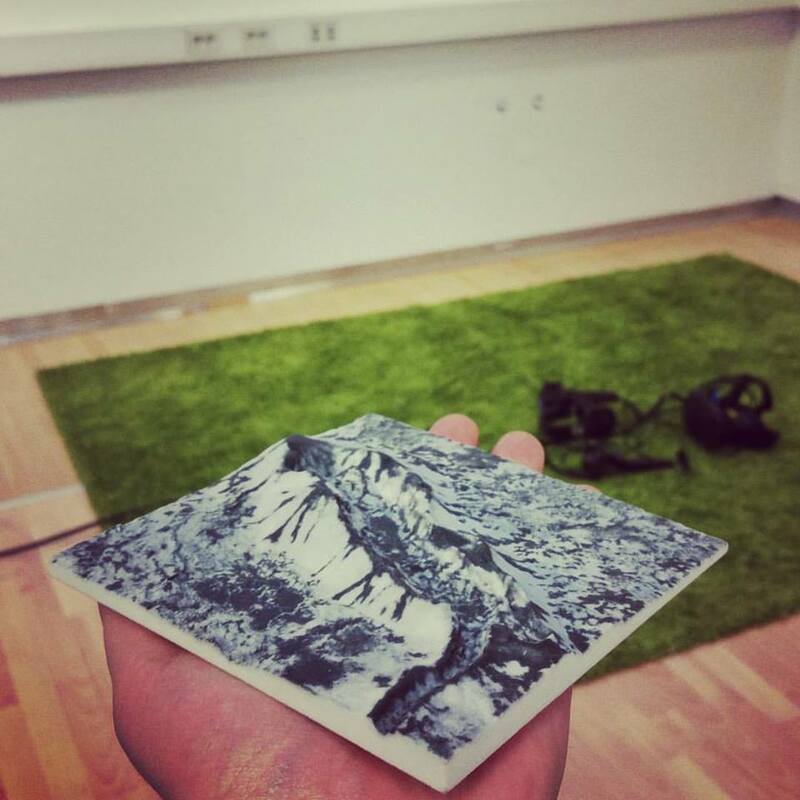 After a few days, the print was in our hands and we could start the project. This saved us so much cost and time compared to other traditional manufacturing methods. Not to mention the professional look of the rig from 3D printing. Our big drone O1 had served Svarmi for some years and it was time to replace it with a new improved drone. O1 was fully designed by Svarmi and used some 3D printed parts but mostly it was constructed out of CNC cut carbon fiber plates. Our old drone the O1 fully designed and built by Svarmi. 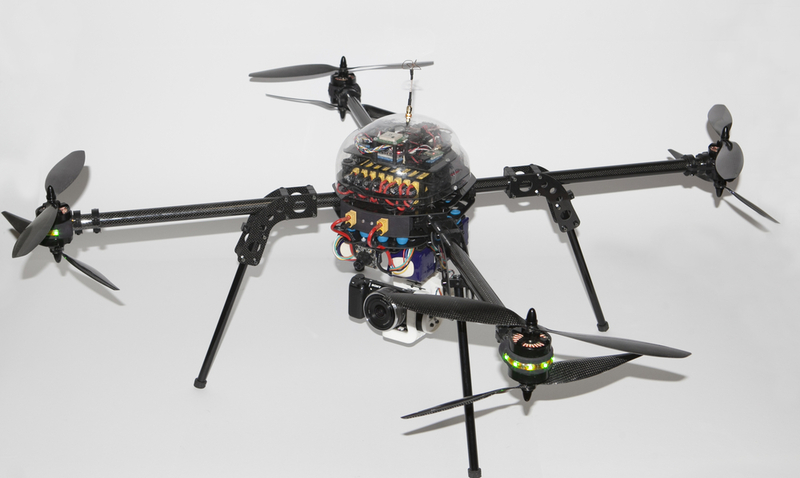 This drone served as a good test platform for the first trials of 3D printed parts for drones. Major components like the camera gimbal were fully 3D printed. 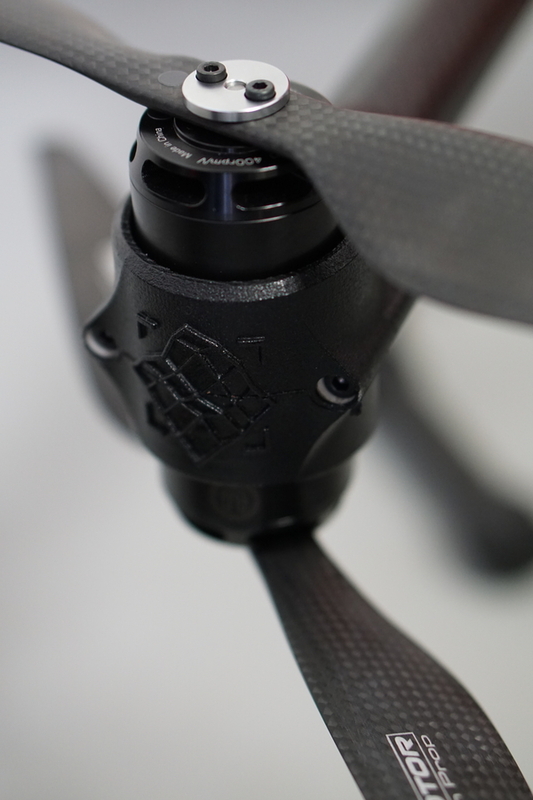 The drone was mostly made out of CNC cut carbon fiber, but some important parts like the gimbal were made with 3D printing. The quality and strength of those parts came as a surprise. With this knowledge and the good experience from our 3D printed rig for the aluminum smelters, we decided that our next drone should be fully 3D printed. The reason was mostly to reduce the weight of the drone by reducing the number of components but also and no less to reduce the time required for assembly. The resulting drone was a great success, to say the least. The number of components was reduced by a factor of almost 6 and the time to assemble the drone went from being almost two weeks to two days including all the soldering required. The total weight of the drone was also reduced by a factor of 20%. This is although not the biggest benefits we see of having our drone 3D printed. Now we have all the parts for our drone with a few days lead time but we don’t need to invest in any stock or big production batches. We can make minor changes to each version we print so we can gradually improve our 3D printed drone and there is no need for major changes between big production batches. 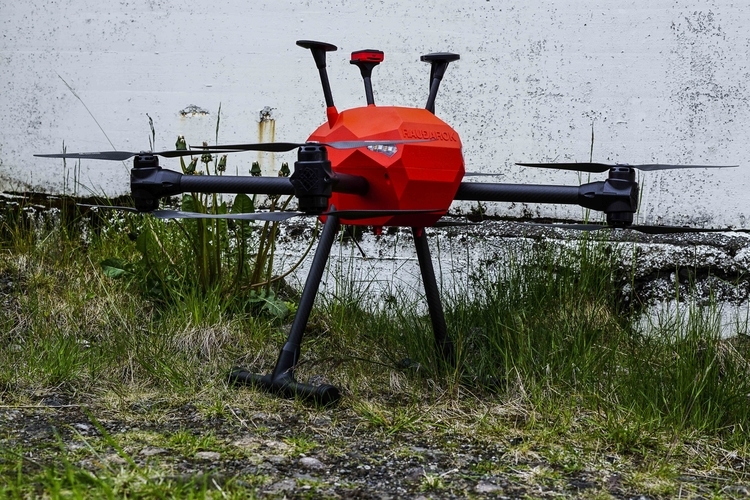 This drone, Rauðarok also serves as a proof of concept for our next big adventure, a fully autonomous drone where the plan is to use 3D printing as a mass manufacturing method and be able to manufacture on demand. That project has already started and has received funding from the Technology Development Fund of Iceland and currently we are seeking investors to continue the development. Rauðarok our first fully 3D printed drone. The only parts not 3D printed in the frame are the carbon fiber arms and legs. Everything else was printed in Sculpteo’s Nylon PA12. Rauðarok is a coaxial octocopter, meaning that on each arm there are two motors. Mounting those motors together is a challenge, especially so they can be used easily. With 3D printed motor mount this is now a breeze. Also, the number of components on the motor mounts was decreased greatly with 3D printing compared to early designs not fully using 3D printing. Can you explain to us how your product development process works at Svarmi? Our product development is based on our customers’ requirements. We design our drone according to their wishes or integrate the sensors they require for very specific remote sensing missions. Time is always a big factor as well as minimizing costs. That’s why other traditional manufacturing methods are too slow and costly for our purposes since we need to be able to have something ready within a week or two. After integrating the new sensors to our drones we test them out with our customers and redefine the requirements if needed to suit the task and sometimes redo the process again by refining the design or selection of sensors. How long did it take you to develop your product (from idea to the launch of the first production run)? I think the fastest we have done is within one week. That is design the part in our CAD software, send it to Sculpteo, receiving the part and integrating the part. The thing we also like once the part is sent for 3D printing is that we can allocate our manpower on something else while the part is being manufactured. No need to spend time on adjusting some machines, or adjust our 3D printer – those days are gone and we can focus on what we are good at. Yes, we own a 3D printer we just don’t use it since the quality is much worse and it is much more expensive for us to operate than to use a 3D printing service like Sculpteo. For which steps did you use 3D printing during your product development process? We use 3D printing for all of our steps of the product development process, from prototyping to producing the final product. 3D printing is just so much more than just a prototyping technique! Why was it relevant to use 3D printing during the development of these products? We often need to design complex three-dimensional parts that before would just have been way too expensive to manufacture. So, the manufacturing methods put immense restrictions on our design. We could only use simple two or three-axis CNC machines to produce our parts in order to keep within the budget of the project. Now we design and almost don’t need to think about how we will manufacture the part. When do you think that 3D printing really helped you? Without 3D printing Svarmi would not have been able to survive, it’s as simple as that. So both the appearance of our drones and products, as well as being able to develop fast and cost-effectively have been key for us. People are usually very surprised that we actually design and build the things we do: the parts look as if they were made by a very large company using methods like injection molding or other complex and costly methods. We design all our parts in-house using Autodesk Inventor. We also use PIX4D to create 3D models from the images taken with our drones. Do you plan on keeping using 3D printing for product development? Yes and not only for product development, also for manufacturing. We believe this is the future, and 3D printing will replace many of the more traditional machines used today for manufacturing. In the end, how much time did 3D printing make you save on your product development process? Product development process usually starts by defining the constraints, and usually, the manufacturing constraints are a big factor. With 3D printing, one does not need to think too much about how to manufacture and can save maybe up to 30% of the initial concept design time. In the design process, this can save even more time, up to 40% by reducing the number of components that one needs to design or source, as well as being able to design with much less restrictions than for example for a milled 3D part, not to mention the time saved in the CAM process. Also, time is saved in making the drawings for manufacturing. For rapid prototyping, 3D printing, of course, outperforms most if not all other methods and greatly saves time for making prototypes that can be analyzed and which design can be improved accordingly, fast and efficiently. Do you also use 3D printing for the production of finished products? Yes, almost all of our finished products are 3D printed. So, we use 3D printing just as much for prototyping and for final products. 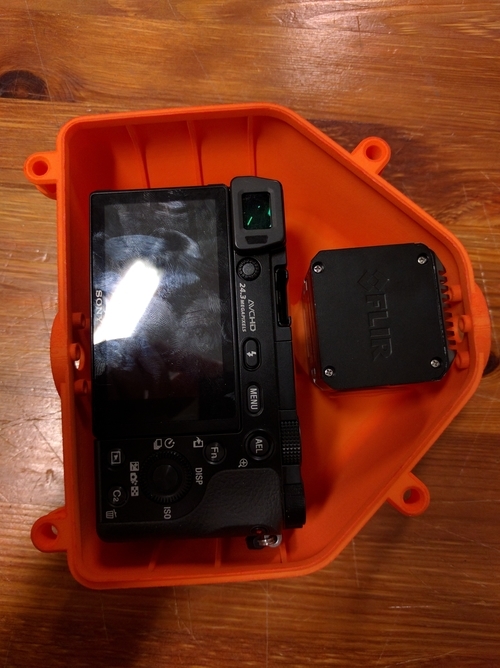 Do you use 3D printing to customize your products for some customers? That is one of the great things about 3D printing is that it’s so easy to make a great looking, strong, highly capable, customizable product that also looks just as good as a mass manufactured product. Do you think 3D printing helped you improve customer satisfaction? Without a doubt! With 3D printing, we can provide highly customized products that outperform anything else and look very good. As you can see 3D printing can help you achieve great results! It can make you save 40% time on your product development process and reduce many things: the number of components of your object (here, by a factor of 6), total weight (here, less 20%), and assembly time (here, from two weeks to two days). Using 3D printing for product development gives you a lot of flexibility: you don’t need to stock the elements or invest in huge production batches. This flexibility helps you gain a significant competitive advantage. You can allocate your human resources to other purposes while the parts are being manufactured: they can focus on what matters most. Did you enjoy this customer story? Discover the story of another of our customers, Simusolar, using 3D printing to create devices that work with solar energy in Tanzania. Ready to improve your product development process? Start using 3D printing now!